The use and history of the city’s police and fire call boxes has often provoked much curiosity by residents and visitors alike, with over 875 of the abandoned boxes having recently been scraped and painted by the District Department of Transportation over the past few years. They can usually be found on street corners, and are now part of an exclusive program that I myself spearheaded at Cultural Tourism DC coined “Art on Call” that aimed to rejuvenate, celebrate, and rehabilitate the street furniture into neighborhood icons melding both art and history. The first boxes were completed in July of 2004 by the Historic Mount Pleasant organization which feature nine call boxes outfitted with intricate bronze sculptures by artist Michael Ross. Elaborate fire and police call boxes like the pictured here are believed to have been first installed throughout Washington beginning in the 1860s and what is referred to as a harp shape. They complimented a large system of gas street light illumination, first installed in the city streets in 1848. The peak of gas illumination was reached in 1926, however, when there were 12,371 gaslights burning in the city. 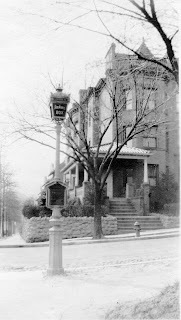 The fire call box seen at right in the vintage image was installed at the corner of 18th and Kenyon Street, N.W., in Mount Pleasant sometime after 1910, and was typical of these early designs; a round or octagonal cast iron base, a call box, and a tall lamp post atop which concealed a gas burner. Red glass with etched white lettering was illuminated from behind with a constantly burning gaslight. They were manufactured by the Gamewell Corporation of Upper Newton Falls, Massachusetts, which also manufactured the police call boxes added later to the alarm system. 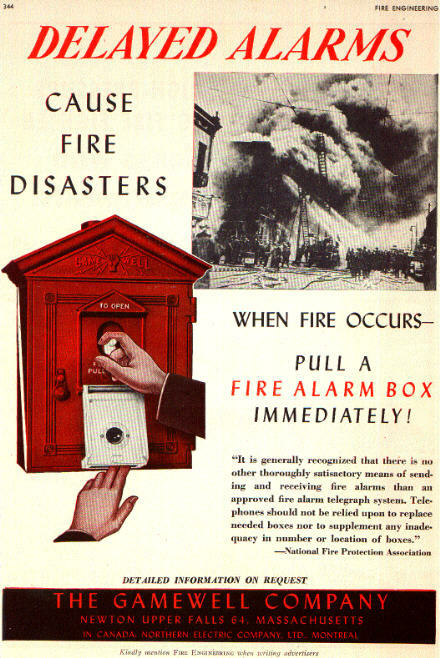 The early fire call box required the sender to break the glass, turn the key and open the door, then pull down hook inside to transmit the alarm to a central alarm office where the box number was tapped out on a bell, flashed on a red signal light, and punched out on a paper tape register much like a stock ticker. There was also a telegraph key and sounder inside each box, which the chief or chief’s driver could use to order a greater alarm or all-out fire signal to the central alarm office. The early round pedestal designed for Washington is called a “Nott” base and was the original pedestal used for holding Fire alarm box; it was painted black with the alarm box painted red. 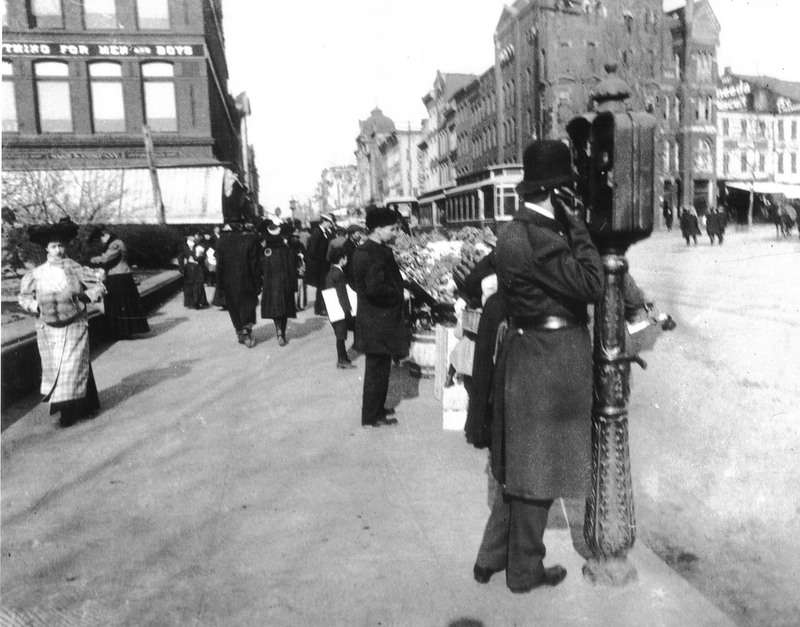 Some early fire call boxes were mounted directly on trees or building walls. A 1923 decision to convert the gaslights to electric was gradually enforced over the following decade, and the last three gaslights were turned off on June 23, 1934. 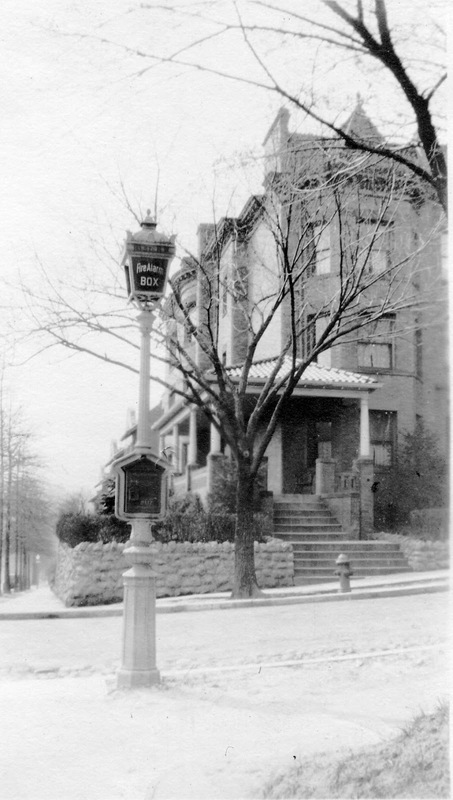 Washington’s fire call boxes then adapted a large, white globe electric light fixture placed atop the light pole. Later still, these globes were replaced with small orange industrial globes still seen on some of the boxes today. Each fire alarm box had a spring wound movement like an alarm clock which, when the switch was pulled, it sent in four rounds of its location code number to the central alarm office which is still located near McMillan reservoir. The first call boxes installed Washington in the 1860s were apparently painted black, and always kept locked. A sign over the box on the pole notified where the key could be found, usually at a corner grocery store or other retail establishment. Each key was numbered and trapped in the door until the department arrived so they could see who opened the box to send the alarm. Starting in the late 1880s the color scheme changed when Police boxes were introduced, which were painted blue, and the older fire call boxes were painted red; both with a gray base. Fire call boxes had a simple pole and protected light on top, which was constantly illuminated to aid public and police in locating the boxes at night. Fire call boxes provided a protected switch for residents and pedestrians to pull in the event of a fire, signaling the department in a central dispatch office that a fire had been spotted in that particular block. These boxes were painted red, and identified with a unique number for identification. By the early 1930s newer fire boxes were used which added a quick action door on the front - the user simply pulled down the door and pulled the hook to send in the alarm. By the mid-1890s, when the cables were placed underground in conduits, the city started using ornamental iron posts to mount the boxes, and possibly a few old gas street light bases. By the late 1910s, Washington began using a telephone handset in the police boxes, which was for the exclusive use by police officers for voice communication with their police precinct. Police boxes can be easily identified by their one sided, flat panels with a curved top, and without an extended pole. Fire call boxes, on the other hand, can be identified by their house shaped box area, operable doors or an open frame, and extended pole on top. Police officers often knew which box numbers were prone to false alarms or pranks by local children. The Police call box was painted blue with a grey base. All early police boxes were on party lines so the cop would have to pull the box lever to identify which box he was at on the circuit. There was also a pointer in the early boxes for Ambulance, Paddy Wagon, Riot, Fire, etc., so special signals could be sent in. The locked front door had a citizen’s key, which by inserting the key in the door, a wagon call could be sent in for accidents, etc., by a passersby who would obtain a key from a corner grocery store or prominent business. Throughout tenure of the PSS system, the yearly City Directories recorded detailed annual statistics. In 1925, it reported that 806 fire alarm boxes were in service, with a total of 2,670 alarms pulled that year, 278 of which were false. The city had added 24 new fire call box locations that year alone. 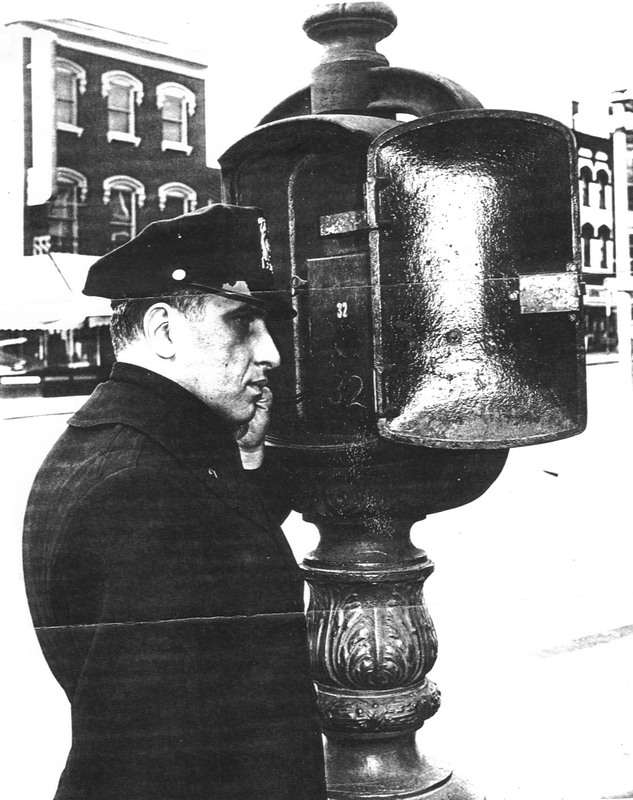 In addition, it was recorded that there were 489 police call boxes operable in the city that year. The two types of call boxes were wired together and to their respective central commands by an astonishing 7,344 miles of underground cable. Paul Ponzelli, a retired police officer, recalls call boxes in Georgetown having heavy rings affixed to the base in which occasionally an officer might handcuff a suspect and use the phone call the central command center to send a car to take the individual to the station, all the while continuing his rounds. Ponzelli also revealed that two call boxes were executed in polished brass, one being located in front of the White House, and one being at Union Station. The latter was used by President Roosevelt when his train arrived at the station to signal the White House that he required a motorcade to the executive mansion. The box remains in a private collection. The Gamewell Corporation advertised heavily with a fear campaign theme, and as a result, thousands of cities worldwide installed their systems. Many other cities had call box system manufactured by such companies as Gamewell. Several different styles of bases and boxes were made but were individually designed for that particular city. San Francisco still operates a call box system with both the police and fire boxes attached to a single pole. 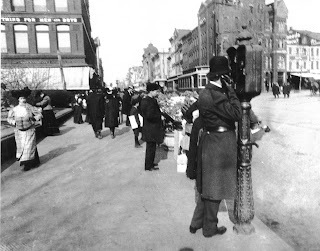 The early gas light poles and call boxes in some cities like New York and Boston had the operating instructions etched in the red glass atop the box. Washington is on of very few cities that have any remnants of the system left in the original location on the streets. Of the 1,500 initially installed, approximately 875 remain today, found in all quadrants of the city. In most cities, walkie-talkies and car two-way radios caused the initial downfall of the police and fire boxes. The call boxes in Washington were maintained by the Department of Public Works with many remaining in use until 1976, when the 911 system of emergency contact was fully established in the city. Many of the police and fire call boxes were abandoned after the 1968 riots, however, when civil unrest destroyed many of those in the affected areas, while others were continually used for false alarms. This is a fantastically detailed history of the questions I've always had about the Call Boxes. Totally sharing/crediting this in my own adaptation. I miss the days when these call boxes were common. I have always thought that they constituted extreme ease in contacting an official. Now police are too busy to be bothered . It comes out quite beautiful. The areas are biased towards my home - work - run - cycle areas but I'll expand out slowly to cover DC.